Nancy Holden, editor of Roots-Key, created a special double issue to mark this milestone. The issue also included a nine-page centerfold spread of pre-1900 photographs of JGSLA ancestors. David Hoffman composed a 25th Anniversary Memorial Program Booklet that generated donations to a Special Projects and Programs Fund. Pamela Weisberger filmed and edited a video, “Genealogy, Anyone?” which combined interviews with founding members and present members. The video was shown at our October 25th Anniversary meeting. 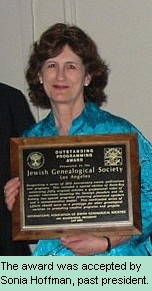 Miriam Weiner, JGSLA member and noted genealogist, was one of our featured speakers. In honor of our anniversary we presented a special speaker, at the Skirball Cultural Center. 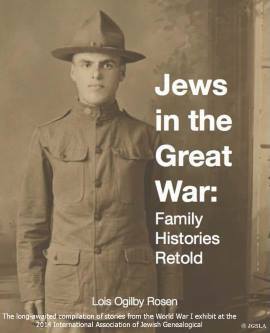 Program Vice President, Jan Allen, organized a speaking tour for Yale Reisner, from Warsaw to the U.S. and Canada, with the cooperation of five other Jewish Genealogical Societies. Programs were co-sponsored with major Jewish institutions in Los Angeles, including the Skirball Cultural Center, the Museum of Tolerance, the Simon Wiesenthal Library and Archives, and the Jewish Community Library of Los Angeles. The society participated in a very successful Yiddishkayt Festival at the Japanese Cultural Center in Los Angeles, and in special events at the Museum of the American West/Autry National Center, and the New Jewish Community Center at the Milken. Recognizing a series of 25th Anniversary events, publications and programs. This included a special edition of Roots-Key containing fifty original articles, a professional video of member interviews honoring the Society’s founders and its history, two special programs featuring prominent speakers and a commemorative booklet. This coordinated series of efforts should serve as a prototype for other genealogical societies in promoting creative programs and projects.